people from Ohio, Minnesota, Oregon or Washington trying to find their place in the sun. If one of my favorite crime shows, "The Killing", is to be believed, the sun NEVER shines in Seattle. Of course I know it does. At least it did when we were there one August a couple of years back. I recently talked with a Florida native who was transplanted to Seattle about twenty five years ago and she still hates it. Says she's coming back to God's Country as soon as possible. I listened to her laments and understood completely her heart's desire to return to the giant oaks, slower pace and unique people of North Florida. Well, not only is this part of Florida the place of my childhood, but I am constantly drawn to another place of my youth over and over. That's right - The World;s Most Famous Beach - Daytona. The cars, the girls, the life guards trying to pick up girls, the first Steak & Shake in Florida, the Boardwalk and the beach food all made Daytona THE place to be in summer. With hotels and motels like The Castaways, The Americano, The Lido and The Sea Dip, it was THE place in the fifties for the very best summer had to offer. Unfortunately, that was indeed the good old days, and it doesn't appear that they will be returning anytime soon. Condos rule the day in the New Millennium in Dayton Beach proper and most of those iconic hotels are no more. Kids have moved on to more hip destinations in Florida and elsewhere and families drive for hours with the kids in tow to pay insane prices and see the make believe Florida of Disney, Universal and other mega tourist destinations. However, there is hope my fellow vagabonds. Just head south on I-95 and hang a left at State Road 40 (Granada Boulevard) for a few more miles then right onto South Atlantic Avenue to one of the coolest little boutique numbers on the east coast of Florida - The Lotus Boutique Inn & Suites in Ormond Beach. Some view Ormond as Daytona's uppity cousin. I just like it because of this great little hotel (this is our third visit) and enough great restaurants to satisfy even the most discriminating foodie. If you want to read about our first stay when we discovered The Lotus check out my post - The World's Most Famous Beach and The Lotus - Sweet!! . Ah yes. The World's Most Famous Beach indeed. There is none like it for people who have read the book and love to practice the art of doing absolutely nothing. Packing. Every architect worth his or her salt is, by the nature of their training and their very DNA, an expert in the world of packing. We have been trained to get more in less space than other people. The holy grail of all architects is the design of a space so perfect, so minimal in nature that nothing is wasted. As an architect and vagabond, I apply that same concept to packing. To some, packing is just getting it all in the car. Pathetic!!! No - Packing is something that demands and deserves intense creative thought and planning, as if you were sketching the next masterpiece worthy of the Pritsker Prize. On occasion, I have witnessed the slovenly stowing of gear by travelers who take no pride in the process of planning and organizing their "stuff" for a trip, road or otherwise. It is simply unnatural! Luggage. Buy good luggage. My Hartman bag looks like the day I bought it fifteen years ago. And its been a bazillion miles. For road trips, of course, you also need those other support containers for the long list of items needed for the perfect trip. Planning. Good packers make lists of items. They plan the packing the night before. And they simply do not allow last minute distractions to keep them from their goal of the orderly organization of all items necessary for quality travel. Take Charge. Packing is not a group activity. 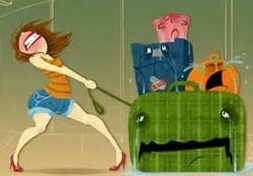 It is a singular and focused activity of one individual who knows where he/she is going and why. Be Organized. It goes without saying, you must have everything in the proper containers and have knowledge of how those containers will interact once packed. Otherwise, it will look like you don't know what you are doing. Know Your Destination. This is critical. If you are just going to grandma;'s house, you can throw a few things together. But, if you are going to the beach, well, let's just say, you have to know how to take it to the next level. Beach chairs, coolers, extra large towels, groceries, beach clothes, night life clothes, eating utensils, etc. etc. etc. The list of stuff you take to the beach is very, very long. Packing of this much paraphernalia in the trunk of the smaller cars of today is simply not for amateurs. Clean Car. No self respecting Nomad can leave the driveway in a dirty car. It is bad form and utterly lacking in style. So make sure the car is clean. Getting It All In. This is the final step of the planning, the packing and the organization. So don't screw it up! Take your time. Make sure that it all fits properly and make your old dad proud. Of course there are other factors that impact the perfect road trip. The perfect little place helps of course and the one your with is obviously critical. My one and only and I have been to so many places that we are very much like peas and carrots, travel wise. And its even better when the kids are along. If you are, indeed, one of the rare breed of de'excellentes emballeuer, having the kids around will afford you an opportunity to teach them the finer points of getting a lot of stuff into a small space. And one last thing. I mentioned earlier my desire for the perfect place that isn't overrun with tourists at the height of tourist season in the most tourist infested state in the good old USA. That is accomplished by finding places that tourists don't usually go, like a small fifty room boutique hotel in the less populated part of a very popular area and not going on the weekend, if possible, when places, particularly the beach tend to be much busier. All I know is, that by this time tomorrow, I will be continuing my quest for the perfection of the art of doing absolutely nothing. Video Artist of The Week - Delbert McClinton, one of the truly original Texas songwriters, singers and harmonica player on the original Beatles tune "Love, Love Me Do", is this week's video artist. How's that for trivia? The video below, "Too Much Stuff", with support from legends Lyle Lovett and John Prine, brings it all home for this week's post. 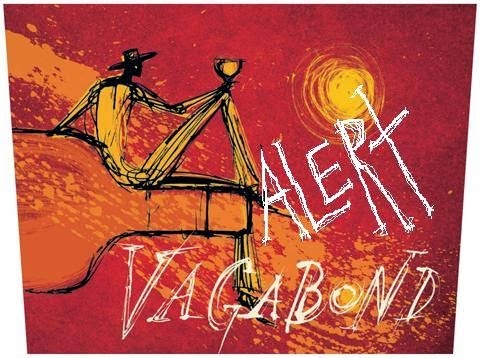 My first Random Vagabond Alert Post (January 10, 2013) was about a very sweet deal at a very cool little boutique inn on the Ashley River a mere twenty minutes outside of Charleston. We spent three days at this one of kind place on our thirty ninth anniversary in 2012. Well, Living Social is at it again. If you are looking for a little romance in a cutting edge, modern, award winning hotel, located on the grounds of an immaculately groomed plantation, Living Social indeed has a deal you can't refuse. As I stated in the original post, I don't find particularly interesting places on Living Social or Groupon, but, I highly recommend checking this one out. The deal, similar to last year, gives you a great price ($334) for two nights in a river front room, a decent "healthy start" breakfast, a little wine and cheese in the afternoon, free bike rentals and admission to the oldest established landscaped gardens in the US at The Middleton Plantation. Plus, you are a quick twenty minute drive to Charleston, a mecca for all serious foodies. If you want to read about our visit to The Middleton and Charleston back in 2012, just check out my post - Modern Meets Southern Vernacular at The Inn at Middleton Place. So - surprise the one you love with a very cool road trip to one of the coolest Nomad Sleep Overs in the Southland. There are only twelve days left before the deal is gone and it only has fifty five rooms so don't delay. Trust me, with the prices of hotels going through the roof everywhere, this is a deal you can't let pass. 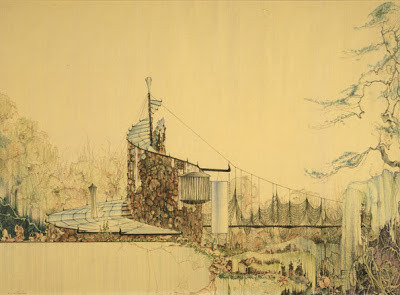 In 1978, while a grubby architecture student, I had the pleasure of hearing a lecture by the great master architect Bruce Goff in my final year of architecture school. At the age of seventy four, with his multi-colored coat and bola tie, he was the embodiment of the eccentric genius we had all studied since our freshman year. He spoke with great passion as he explained the ideas and methodologies behind some of the most cutting edge, organic and eccentric buildings ever designed and built. His understanding of the nature of materials, architectural form and the synergy between structure and space was truly exceptional. With over five hundred building designs to his credit - half of which were built - Goff had a long and remarkable career as a true practitioner of organic architecture. From his early correspondence with Frank Lloyd Wright, the father of organic architecture, Goff became a true iconoclast in the world of architecture, designing some of the most idiosyncratic buildings that critics often found shocking. One of the most iconic and famous houses, designed and built between 1950 and 1955, was the Bavinger House. This exotic house, built by the artist/owner, Eugene Bavinger, over a five year period, embodied the limits to which true natural, organic architecture could go. Imagine my surprise when I discovered - while developing an itinerary for a southern Mississippi- Arkansas-Oklahoma-Texas-Louisiana road trip - that this iconic masterpiece is gone. It was one of the places I always planned to visit, but, for a variety of reasons that I don't even remember now, I never seemed to make it happen. As we were planning our June South Loop To Austin Tour, I discovered that the location of the Bavinger House was just a couple of hours from the completely renovated and updated Inn at Price Tower by Wright, a hotel we plan to stay in on our road trip. Then, much to my chagrin and utter disappointment, I discovered that this rare work of true architectural genius is no more. Many conflicting stories postulate a variety of reasons for the demise of this great house - from extensive storm damage to the son of the original owner actually tearing it down! It is very disconcerting to architects and lovers of great design when any work of architecture, particularly one so well known, is allowed to be destroyed by age, lack of care or modern development. In my home town of Tallahassee, The George Lewis House, the only house designed by Wright in Florida, has been vacant and allowed to slowly degrade for years. One can only hope that we don't lose another modern architectural masterpiece due to neglect or modern times. From the beginning, this blog has been about the importance of design and architecture as something to be enjoyed from afar as well as experienced intimately, as you rest your mind and your soul in places of environmental distinction. Frank Lloyd Wright called architecture the mother of all the arts. And no work of architecture has the impact on our lives like residential design. Visionaries such as Wright and Goff have given us timeless treasures that, if properly cared for and utilized, show inhabitants and patrons alike that great architecture is important to an enlightened culture and the enhancement of our daily lives.